General Nathan Bedford Forrest did not lose many battles during the Civil War, and the battle of Tupelo is one of the handful he lost. After his masterpiece of Brice’s Cross Roads, go here to read about it, Forrest was regarded as a potential mortal threat to the supply lines of Sherman. Major General Andrew C. Smith was sent out from La Grange, Tennessee on July 5, 1864 with a Union force of 14,000 men. His mission was to find Forrest and defeat him, and thereby prevent him from staging raids into middle Tennessee to cut Sherman’s supplies. On July 11, 1864 Smith was in Pontotoc, Mississippi. Forrest was nearby at Okolona, Mississippi, and was under orders from his commander Stephen D. Lee not to engage Smith until Lee reinforced him. 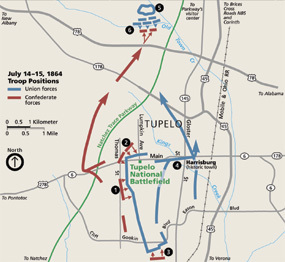 On July 13, Smith became apprehensive of an ambush and marched his force to Tupelo, Mississippi and took up a defensive position. Lee having reinforced Forrest, on July 14, beginning at 7:30 AM, Lee launched a series of uncoordinated attacks with his force of 8,000, all of which were bloodily repulsed. Lee halted the attacks after a few hours. Forrest would attack again, once in the evening and once on the morning of the 15th, both attacks being repulsed. Smith attempted no pursuit, for which he was heavily criticized, and on July 15 retreated himself back to Memphis, pursued by Forrest. Smith did accomplish his goal of stopping Forrest from raiding into Tennessee and he was now a member of the exclusive, and minute, club of Union commanders who defeated Forrest in battle. Union casualties were 648 to 1300 Confederate.